Unlike traditional green tea, matcha preparation involves covering the tea plants using shade cloths before they are harvested. This triggers the growth of leaves with better texture and flavor, which are hand selected, and steamed briefly to stop fermentation. Then these leaves are dried and aged in cold storage, which deepens the flavor. The dried leaves are stone-ground into a fine powder. Matcha has a healthy form of caffeine, and should not to be mistaken with the one present in regular coffee. This unique form caffeine is known as theophylline, which helps in sustaining the energy levels without any adverse effects. The slow release of energy that is due to theophylline helps in maintaining optimum hormonal levels and supporting the functionality of adrenal glands. Matcha is grown in the shade, that is why it is richer in chlorophyll, as compared to other green teas. Chlorophyll is the pigment that is responsible for giving leaves their green color. Chlorophyll is shown to detoxify the body, but this has yet to be scientifically proven. Also, it contains ability that can clear the body of heavy metals, toxins, dioxins, poisons and hormone disrupters. Matcha is loaded with health-promoting compounds, including some that have been linked to cancer prevention in animal and test-tube studies. In a study, green tea extract slowed the growth of breast cancer cells and decreased tumor size in rats. Matcha is especially high in epigallocatechin-3-gallate (EGCG), a type of catechin that has been shown to have powerful anti-cancer properties. A study reported that the EGCG present in matcha can help in fighting prostate cancer cells. Other test-tube studies showed that EGCG is effective against lung, skin, and liver cancer. Remember that these were animal and test-tube studies that looked at specific compounds present in matcha. Further research is needed to known how these results may translate to humans. A study in 1999 that was featured in the American Journal of Clinical Nutrition reported that green tea extract, which are rich in catechins contains thermogenic properties and promotes fat oxidation. It was reported that drinking green tea increased thermogenesis, or your body’s rate of burning calories, from 8-10% to 35-43% of daily energy expenditure. Also, another study showed that exercising immediately after consumption of matcha green tea have resulted in 25% more fat burning during exercise. Both studies reported that matcha green tea can help enhance both fat burning and resting metabolic rate. Studies have shown that individuals who drink Match Green Tea on a regular basis have lower levels of LDL or bad cholesterol, and were displaying higher levels of HDL or good cholesterol. 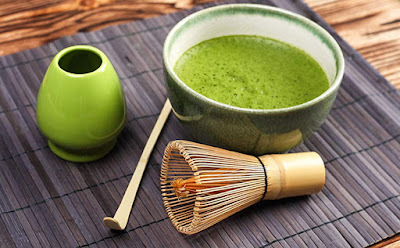 Men who drink matcha green tea are about 11% less likely to develop heart disease, as compared to those who don’t drink Matcha. Another benefit showed by epigallocatechin gallate (EGCG), which is present in matcha is the maintenance of cardiovascular health. The richness of this component, makes it a potent potion to that can help in keeping cholesterol levels low. A study has reported that EGCG helps in reducing the accumulation of lipids and in promoting autophagy in the vascular endothelial cells. Another benefit of matcha tea, is its high concentration of antioxidants. A study showed that matcha tea contains about 137 times the polyphenols, notably, epigallocatechin gallate (EGCG, as compared to that of a regular green tea. This type of green tea contains over 7 times the antioxidants of high quality dark chocolate and 60 time the antioxidants of spinach. There is some evidence that these polyphenols may contain a protective effect against some types of cancer.